Our Mega-Lift XT30 3ton tow truck is mainly used for towing and order picking, and it is especially suitable for goods that move in the continuous flow. It is quite appropriate for industries that just-in-time principles are needed. This kind of tractor has a loading capacity up to 3,000kg, and its operation is safe, efficient and easy. Its advanced integrated drive and control system ensure reliable performance and high efficiency. 1. Italian HYDRAPP hydraulic pump. 5. Its side battery roll-out system makes it very convenient for battery replacement. 6. Low platform step height. 7. Emergency reverse device in the handle improves operation safety. 8. Emergency power disconnection switch. 10. Applied with handle upright and horizontal position, its braking system increases its security degree. 11. Compact design of the control handlebars makes sure that the operator remains well within the truck contours while driving. 12. The adjustable back rest with arms and the full-suspension platform that is surfaced with a cushioning non-skid mat provide superior comfort and stability for long-distance transport. S2S Create & Engineering Co., Ltd is a professional inport of 3ton electric tow tractor from China. 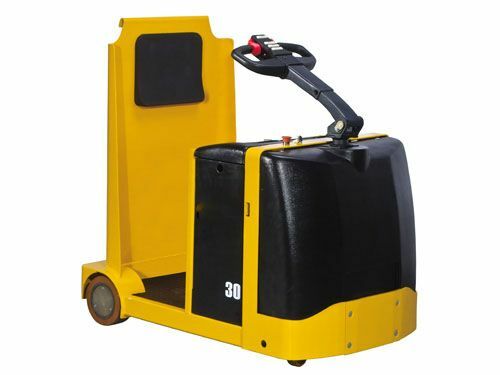 Besides, we also provide clients with electric pallet truck, electric stacker, electric reach truck, scissor lift, aerial order picker, manual warehouse equipment, customized truck, and more. With high quality and competitive price, our products have been quite popular among customers from as many as 40 countries and regions, and many of our products have obtained CE and ISO9001:2008 certification. If you're interested in our 3ton electric tow tractor, please contact us freely.